An American Flag, flown during the past year at a combat outpost in Afghanistan, has a special place in Cheri Blocher’s language arts classroom. The story began last year when Boone Central staff and students were sending Care packages to military personnel overseas. Staff Sergeant McMillan received one of those packages while she was stationed in Afghanistan. In response, Tana sent back an American Flag that had been flown over her combat outpost in southern Afghanistan on July 4, 2013. 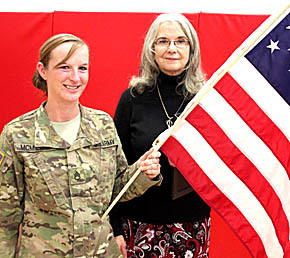 The gift of the flag was acknowledged during the Veterans Day program at Boone Central High School on Monday, and Tana was introduced.